People sometimes ask me why I believe in God. I used to say that belief in God is the only option that makes any sense. 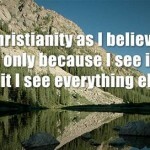 Now, however, I also add that belief in God is the only way that helps me understand and live this life. Many atheists, I believe, have rightly declared their non-belief in a god that truly does not exist. This is an act of pure worship to the God who does. So Christians, let us follow our atheist friends in denying the existence of this false god of power, money, bloodshed, and violence, and instead call people to believe in the enemy-loving, all-forgiving God who is found in Jesus Christ dying on the cross.